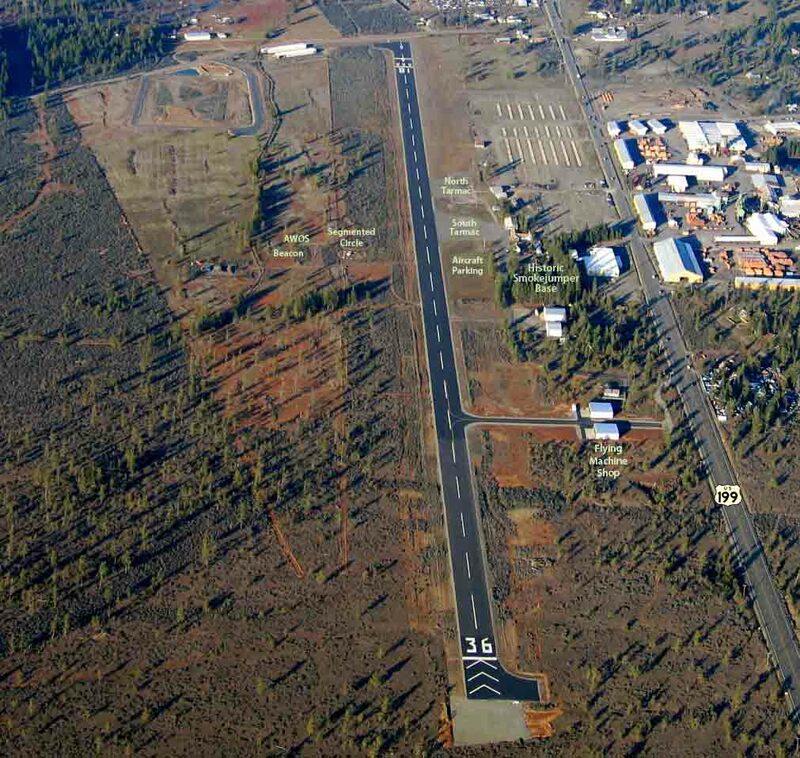 Josephine County Airport webpage with links to airport planning documents, meeting schedules, RFPs, etc. Under-wing tent camping is allowed. 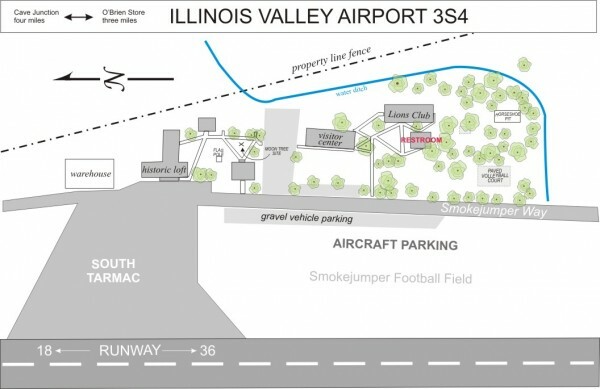 The open area labeled “aircraft parking” on the map above is where most visitors have camped in the past and is close to the restroom/shower. 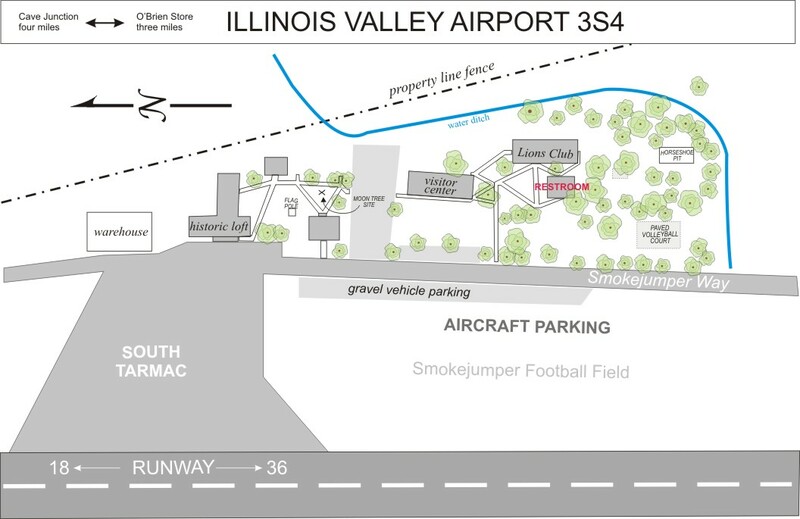 Camping is also allowed on the historic smokejumper grounds. Most people set up on the lawn next to the restroom or wooded area near the volleyball court and horseshoe pit. Showers are available in the building marked “restroom”. 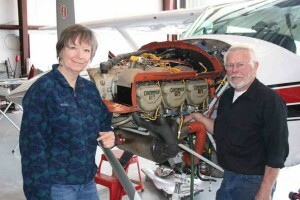 There is no control tower at this field but the owners of “The Flying Machine” in the south hangar have a unicom. They monitor the radio and will respond if they are at the shop (usually weekdays from 9-5). The historic smokejumper base at this airfield was one of the first four aerial firefighter bases in American history and is now the only one of these four facilities that this still standing in its original location with its original buildings. A local nonprofit group has been working to open a visitor center and museum on the site. A self guided tour of the base is located adjacent to the south tarmac and can be enjoyed any time. See Smokejumper Museum for more information. 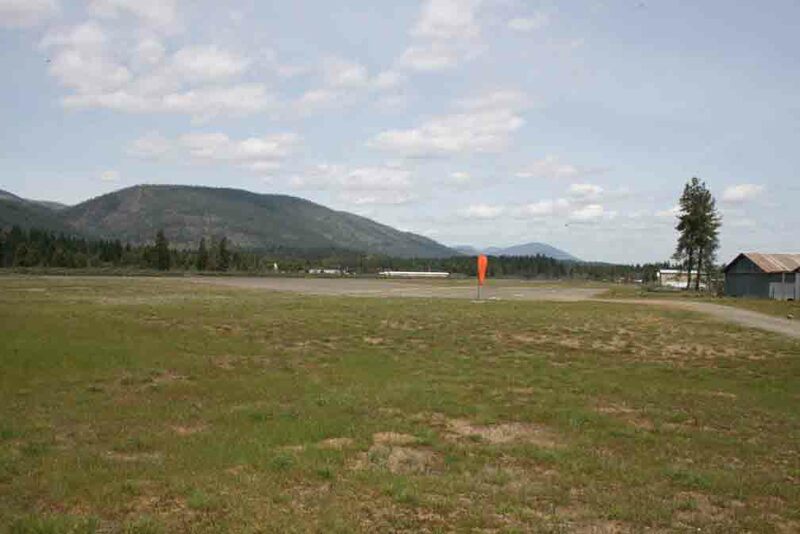 The shaded and lawn covered grounds of the base make this an ideal place to have a picnic where you can enjoy the scenery or watch planes landing and taking off. Tables are limited and there are no BBQ stations at the time of this writing. A half mile walk to the south of the tarmac takes you to Rough and Ready Forest State Park with an opportunity to walk for a mile and a half through Forest Service and Bureau of Land Management botanical areas to a small diversion dam (Seats Dam). A deep swimming hole makes this a popular destination for locals. 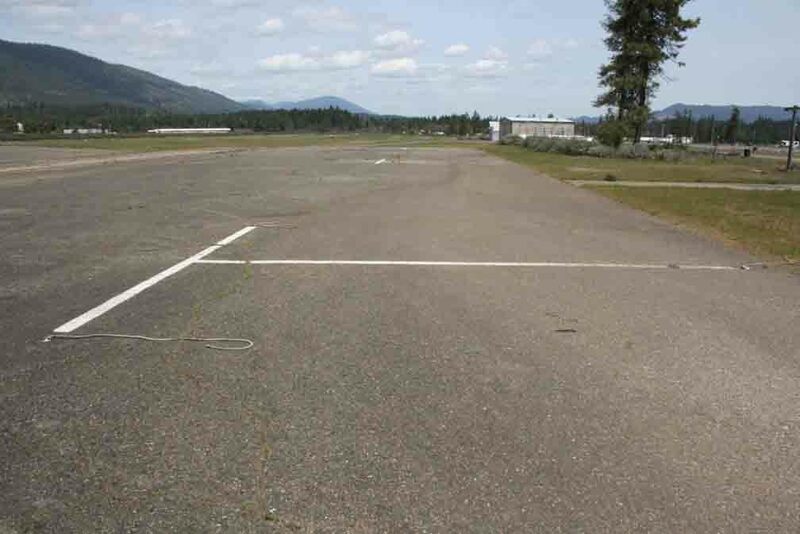 There are tie-downs at both the north and south tarmac on the east side of the runway. No tie-down fee. 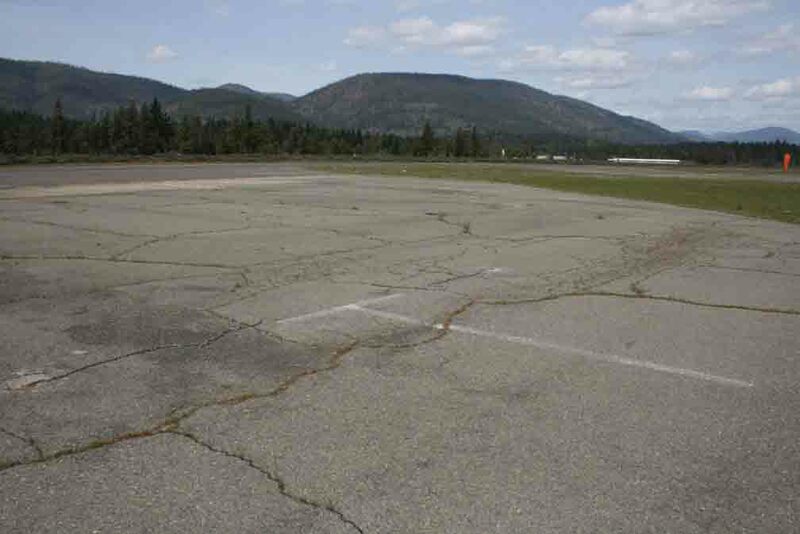 There are no tie downs on the dirt parking area (old smokejumper football field) near the restroom.